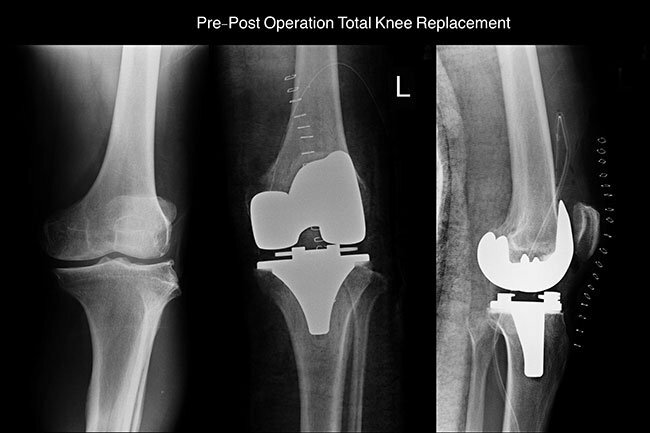 Left knee showing pre and post-op total knee replacement. Currently this less invasive procedure is performed by only a small percentage of orthopedic surgeons in North America. Researchers continue looking at the short-term and long-term benefits of minimally invasive versus traditional knee replacement surgery. When joint replacement procedures were first performed in the early 1970s, it was thought that the average artificial joint would last approximately 10 years. We now know that about 85% of the joint implants will last 20 years or more. Improvements in surgical technique and artificial joint materials should make these artificial joints last even longer.